It was a blast getting out in the sun today and shooting something besides festivals. Here's one of the first photos I took and for the past three hours it's been driving me crazy. 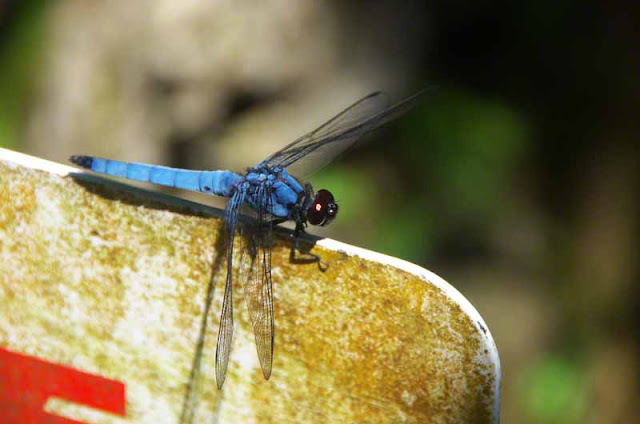 IT'S A BLUE DRAGONFLY WITH RED EYES ! After looking at a few thousand thumbnails of dragonflies, trying to come up with a scientific name for the critter, I gave up. It's making me cross eyed and that ain't good. Anybody out there got a degree in bug-ology? The closest I came to identifying this bug was something called a Blue Dasher. I don't make this stuff up. The scientists named it Pachydipiax longipennis. They're common in the USA but I took this photo in Okinawa, Japan. You don't suppose bug smugglers are bringing them over here and turning them loose in the woods. Nice meeting you here. So far, no luck in the positive identification but, you'd be surprised at the help I get, sometimes after posting here. I'll keep you in mind if band when an ID shows up. Thank you. I've bookmarked the site. It does look promising.